Ball Bearings in Turbochargers: Great for Cars. Not So Good for Aircraft. There’s been a growing trend among automotive manufacturers to replace hydrodynamic and full-floating journal bearing systems with ball bearing-type cartridge systems in turbochargers. In automotive applications, especially in high-performance systems, ball bearings provide better transient response, which means they help reduce any “turbo lag.” According to Honeywell, a leading manufacturer of automotive turbochargers, the time-to-boost improvement attributable to ball bearings can be up to 70 percent. That’s a considerable benefit when you are operating an engine across a broad range of speeds. Turbo lag has always been a bane of automotive turbocharger applications. So if ball bearings are such a great benefit to automotive turbocharger operations, why aren’t they used in aircraft? Some automotive equipment makers are actually trying to introduce the technology into aviation. So far, the results have not been favorable. Why? To begin with, any pilot can tell you there are very few similarities between how turbochargers in a car and in an aircraft operate: The car’s engine/turbocharger continually and quickly cycles between high and low RPM. On an aircraft, the engine/turbocharger accelerates to max RPM during takeoff, then throttles-back and runs at a pretty consistent speed throughout the flight. That very fact is why ball bearings are proving to be less than the best choice for aircraft turbochargers. Remember, the automotive engine spends most of its life operating at speeds below 35 percent engine rating, whereas the airplane’s engine may spend most of its operational life at greater than 75 percent power. That higher duty cycle has a notable impact on turbo bearing loads. 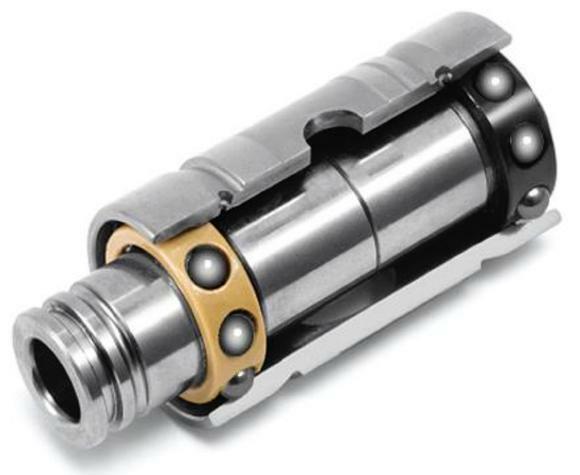 When operated for extended periods at high engine speeds, the continuous motion and pressure on the ball bearings can actually cause them to begin to spall or rut in their housing, which ultimately leads to failure. Another factor weighing against ball bearings is that many of these crossover systems use ceramic or ceramic-coated ball bearings. The ceramic bearings can actually become contaminated with lead deposits from Avgas, which can also lead to premature failure. Hydrodynamic bearings are proven to be better for aircraft engines. When it comes to turbochargers in aircraft, the simple solution is still the best solution. The hydrodynamic, full-floating bearings that are currently used to control the motion of the turbocharger’s rotating assembly do not make contact with the rotating shaft: The turbo shaft is actually suspended in a thin layer of pressurized oil between the shaft and bearing and between the bearing and center housing – thus the name “full-floating”. The dual oil film layers actually act as dampers that help suppress vibration resulting from dynamic rotary motion. Ball bearings cannot provide that same degree of damping due to their design and are, therefore, more susceptible to the effects of rotor imbalance making them less fault-tolerant. In addition, oil flow for ball bearing systems is required to be lower than that of full-floating hydrodynamic bearings. This reduces parasitic drag, which improves turbo lag performance, but the lower oil pressure flowing through the CHRA reduces the amount of heat that can be removed from the shaft by the oil circulating through the engine. Since much of the heat from the turbine wheel is conducted out through the shaft and dissipated through the oil system, the greater oil flow used by the hydrodynamic bearings actually helps reduce heat build up in this critical area. Of course, the continued reliability of the hydrodynamic bearing requires the proper lubrication and operation of the turbocharger, including the adherence to proper pre-shutdown cooling procedures. Something many pilots and mechanics fail to perform. You can find a video produced by Hartzell Engine Technologies covering proper turbocharger cool down below. This video includes clips of the hydrodynamic bearing system in operation, as well as the heat transfer from the turbine wheel. For more information on Hartzell’s turbochargers and turbocharger systems, click here. The Great Debate: Is It Better to Repair, Overhaul or Replace Your Aircraft's Legacy Starter and Alternator?